How to draw Anime girl sitting pose. 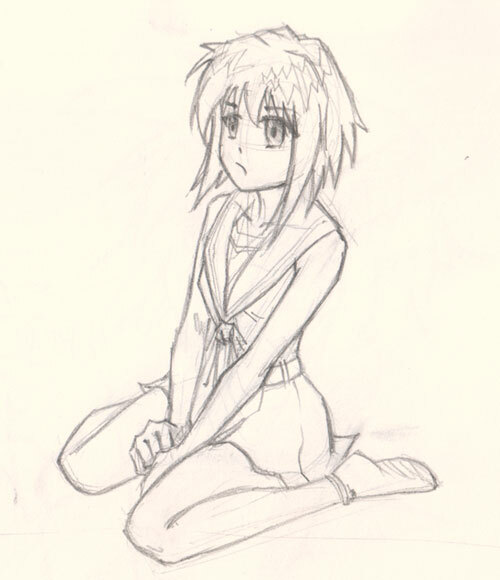 In this tutorial, you will learn to draw Anime Girl sitting pose using pencil on paper. You might need eraser just in case. This tutorial includes both video and step by step still images instruction. In this video tutorial, you will learn how to draw Anime girl sitting pose. She is on her kneeling position with a little bit of perspective from top angle. Also there is a touch of foreshortening involved. I am trying to emphasis on drawing basic geometry shapes to construct the whole head and body. When beginning to sketch, try not to make the lines too dark, make them light to begin with. After you constructed the whole body using lighter sketch, you can build your Anime girl by drawing on top of the existing construction lines that you already rought out. In this tutorial you will learn to finish drawing quick body construction sketch quick and easy. You will see video demonstration of drawing Anime or Manga style face and body: Head Toso and legs. And follow step by step image along the side of drawing video tutorials. Here is the final image of Anime girl sitting. Below are step by step images how to draw Anime girl sitting pose. 1-3) I am just trying to sketch out basic structure of the overall shape of Anime girl body. In step one, I start off with head and torso. Step two, I added hip and legs in sitting position. In three, I draw out her arms coming in downward position. At this point, do not worry so much about little detail, try to get the most accurate big shape of the subject you are drawing first. Step four and five, I establish light and rough construction line for more detail on face, hair, and big eyes. Now, I already have the foundation sketch, then I can just add in eyes, nose, mouth, and hair base on the construction line you already have. There are vertical line and horizontal lines to establish the facial structure as instruct on the video tutorial. Step six, Since I already have all the construction line to go off from. Now we can begin to draw a solid final darker line on face forming in the accurate facial structure. At this point, try to get his facial structure as accurate as it can be. Drawing correctly or accurately is better than getting more lines or add in detail to cover up the mistake or the unsure area, accuracy first then detail. Once you get your structure right, you will most likely have a great drawing without having to put in hours and hours. Oh, thanks! Well done. I will draw this. idk if this tutorial will help me improve my drawing but your awesome drawer!